The Greek word "Epiphanias" means "uprise, appearance", i.e. appearance of the Lord which was celebrated in the early Christian centuries on January 6. In the 4th century this holiday was shifted to December 25, and January 6 obtained the name of The Three Kings (the "Wise Men," the Magi), or simply Twelfth Day. 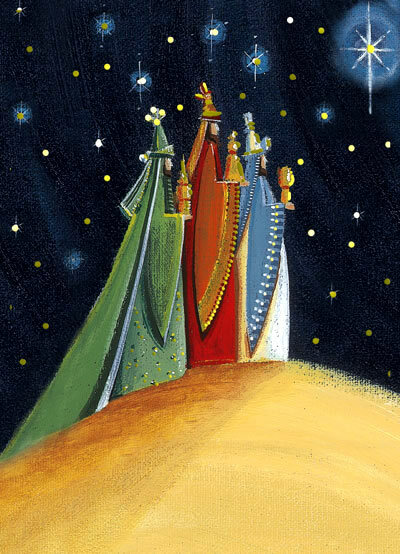 According to an old legend based on a Bible story, these three kings saw, on the night when Christ was born, a bright star, followed it to Bethlehem and found there the Christchild and presented it with gold, frankincense and myrrh. To this day, the doorways would be sprinkled with holy water and the initials of the Three Kings -- C+M+B (Caspar, Melchior, and Balthasar) -- plus the year are inscribed in chalk over doorways in German-speaking countries on the eve of January 6 to protect house and home. (Although historically the three letters are supposed to come from the Latin phrase for "Christ bless this house" -- "Christus mansionem benedicat" -- few of the people practicing this custom are aware of this fact. In many parts of Europe, including Austria, Germany, and Switzerland, the Christmas celebration does not end until this date, now considered the arrival of the three "kings of the orient" in Bethlehem -- and the end of the "twelve days of Christmas" between Christmas and January 6. The custom of the Star Singers, reminiscent of the travel of the Three Kings is still very much alive in Bavaria and Austria. Beginning with New Years and through January 6, children dressed as the kings, and holding up a large star, go from door to door, caroling and singing a Three Kings' song. For this they receive cookies, sweets or money. Formerly the collected donations went to unemployed craftsmen and veterans, today they go to charities of the church or the Third World. January 6, the day of the Three Kings, the last day of Christmas, comes with its own traditions, rituals and symbols. Carolers are going from house to house; in many homes the Christmas tree is taken down and in some areas is burnt in a big bonfire. For the children this is an especially joyous occasion because, associated with taking down the tree goes the "plündern" (raiding) of the tree. The sweets, chocolate ornaments wrapped in foil or cookies, which have replaced the sugar plums, are the raiders' rewards. On this day the Three Kings' cake is baked.